don Miguel Ruiz is the international bestselling author of The Four Agreements (a New York Times bestseller for over a decade), The Four Agreements Companion Book, The Mastery of Love, The Voice of Knowledge, The Circle of Fire, and The Fifth Agreement. The teachings of Ruiz are best known for transforming complex human issues into simple common sense — a talent that has earned him millions of fans, international acclaim, and a vote of approval from Oprah Winfrey. Sales of his Toltec Wisdom Series have soared to over 10 million copies in the United States, and have been translated into more than 40 languages worldwide.don Jose Ruiz grew up in a world where anything was possible. From the moment he could speak, he became an apprentice of his nagual (shaman) father, don Miguel Ruiz, and his curandera (healer) grandmother, Mother Sarita. As a teenager, he traveled to India to study with friends of his father, and at the age of twenty-three, he became the successor to the family lineage. In the tradition of his ancestors, don Jose has dedicated his life to sharing the teachings of the ancient Toltec. For the past ten years, he has been lecturing and leading classes across the United States, and at sacred sites around the world.Janet Mills is the founder and president of Amber-Allen publishing. 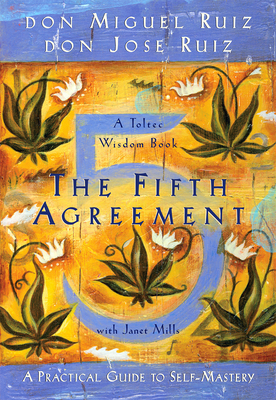 She is the co-author, with don Miguel Ruiz, of six books in The Toltec Wisdom Series, creator of "The Four Agreements for a Better Life" online course, and editor of Deepak Chopra’s bestselling title, The Seven Spiritual Laws of Success. Her life’s mission is to publish books of enduring beauty, integrity, and wisdom, and to inspire others to fulfill their most cherished dreams.